(KPL) Hor Phakeo temple, in ancient times used to host an Emerald Buddha image, has been planned to be renovated after finding several parks of its sanctuary standing at deteriorated conditions. The renovation plan was discussed at a meeting of Responsible Committee for Hor Phakeo Renovation Project on June 28 at the Vientiane Administration Office. Hophakeo lays currently in a bad state, especially some sections of floor outside the wall were cracked and the bottom of some poles presents an initial decay, while its main gate on the East is lower than level, according to the initial survey. Hor Phakeo, a national museum and a tourist destination in Vientiane Capital. “The President has already agreed with the committee’s proposal via report of Presidential Office,” said Head of Vientiane Information, Culture and Tourism Department, Mrs. Vanpheng Keonakone. 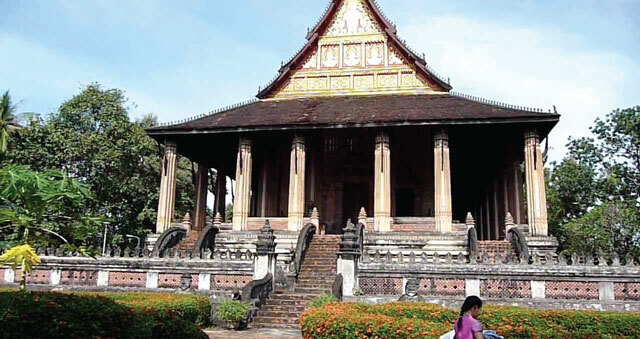 The funds for the renovation work of Hor Phakeo, a national museum and a tourist destination in Vientiane Capital, will be mobilized by private companies and other charities and people nationwide. The renovation work is expected to be completed in 2015 before the celebration of the 40th anniversary of National Day.